What Is Stakeholder Analysis and Mapping and How Do You Do It Effectively? Without stakeholders, there would be no projects to manage. The stakeholders are all the interested parties in a project - the people who affect and influence the project, as well as those who will be influenced by it. Stakeholders can also include people at high levels “above” the day-to-day workings of a project such as a company CEO, university president, or the founder of your agency. Stakeholders can even be people you may not be working with regularly, like members of the public, residents near the site of a construction project, and others. And of course, those who work closely on your project (key clients and liaisons, managers, and team members) are also considered stakeholders. So when starting a project, it’s critical to do a stakeholder analysis and mapping exercise. This will help project and program managers quickly identify the key stakeholders in each area, as well as the types of input they require, what kind of communication they might need and when, and more. In this article, we’ll explain stakeholder analysis and mapping, and how to begin to decide what elements of the project are related to which stakeholders, and how best to set up your project and your stakeholders for great results. Definitions: What Are Stakeholder Analysis and Stakeholder Mapping? Stakeholder Roles: What Are Typical Stakeholder Personas and How Do You Map Them? 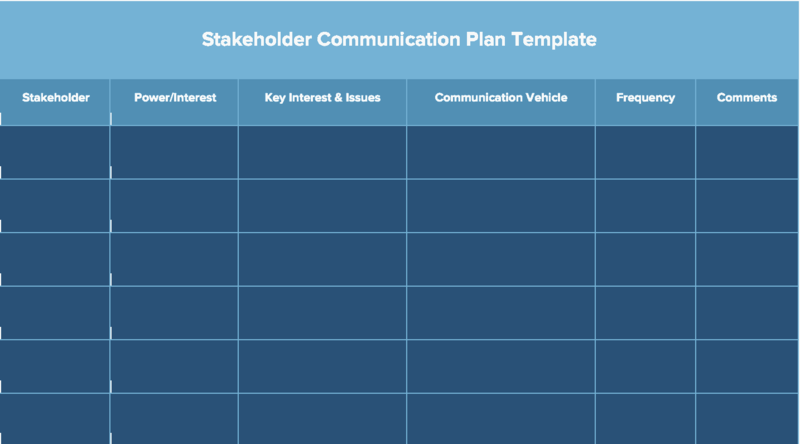 Stakeholder Communications: Who Needs to Know What and When? In order to make your project stakeholders happy, you must first identify your stakeholders, and who needs to know what, and when. Before starting your project, it’s important to identify and analyze, and then map, your stakeholders according to their involvement, emotional and financial investment, and other criteria related to your project. Typically, a stakeholder analysis should begin with a brainstorming session with your project group, including senior leadership of your company if desired. This way, you can whiteboard all the people who may be affected by the project while you are working on it, and after it’s launched. 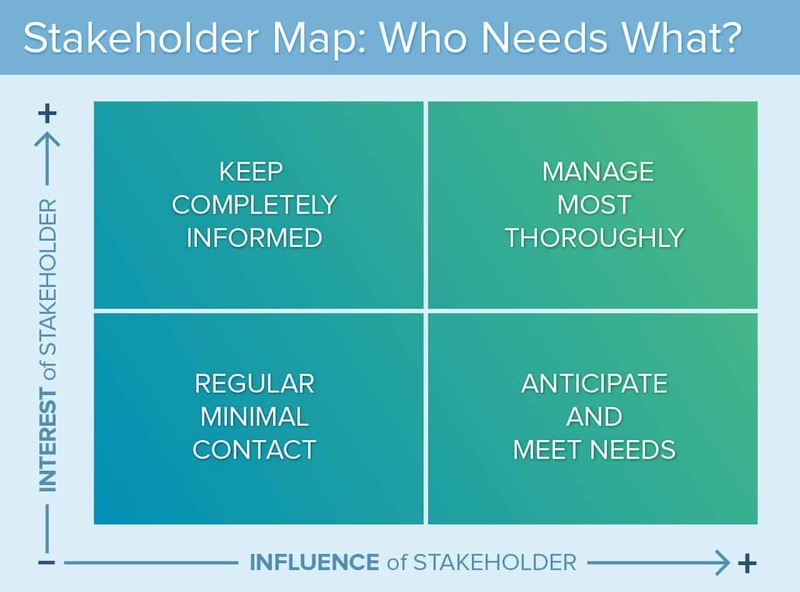 Once you’ve identified the larger pool of stakeholders, you can begin to align them to their level of interest and involvement, perhaps on a simple grid chart. Stakeholder mapping is the visual representation of a stakeholder analysis, organizing those people according to the key criteria with which you will be managing them during the project. Some of those criteria may include interest, influence, financial stake, emotional stake, those on the periphery who are still important enough to keep in the loop, etc. This can be done on a grid or in a spreadsheet. External: The client, including the main client team, their managers, and their division director. Typically there are one or two stakeholders identified as your liaison from the client project team. Internal: Your agency’s top leadership, as well as a traffic manager, accounting department, and executive team members, who all want to see the project run efficiently and profitably. Internal/Project Team: This is the team at your agency devoted to working on this project, including the account director, program manager (if needed), project manager, and other resources like designers, UX designers, developers, copywriters, and whoever else has the necessary skills to contribute to the project’s success. Others: These may or may not include the developer community, tech evangelists, tech influencers, and perhaps even end-users who have been waiting for this software update and will likely use it. An Executive Sponsor: According to Cornell University, an executive sponsor is a manager who is ultimately responsible for securing spending authority and resources for the project. The executive sponsor typically “acts as a vocal and visible champion, legitimizes the project’s goals and objectives, keeps abreast of major project activities, and is the ultimate decision-maker for the project,” according to the Cornell School of Business. In our scenario, this person might be a vice president of marketing and/or of development at the client company. Your agency may not interact with them often, but they have final approval of all scope changes, and signs off on approvals at each stage. A Project Sponsor: This stakeholder is involved at a more granular level, and oversees the project manager. This stakeholder typically follows the progress of tasks at a high level toward completion and also often oversees the project manager. External: Some of these stakeholders are extremely removed from the actual project and can be company shareholders, contractors, oversight groups, and more. Typically these stakeholders need minimal information, but need to feel they are being heard. Internal: These stakeholders include management on the agency and client side, human resources on both sides (who may be asked for more staffing throughout the project), IT, and developers needed to create the project. Once you have identified all the types of stakeholders related to your project, you can begin to analyze them and map them to your criteria. This is where it’s important to ask key questions - and to be as honest as you can in assessing your stakeholders and their needs. Who are the stakeholders who have the most influence on your project? These will include mostly client-side people - typically their project team, the project sponsor, and the executive sponsor. Which stakeholders will be most affected by your project? This can include people from the first group, but may also include outside people. With a construction project, for example, those in the neighborhood, environmental activists, and potential residents of the final building could be in this group. How should you handle important people who actually won’t be considered stakeholders? For instance, in your software project, there may be executives elsewhere on the software team who are key leaders in their department, and who may need to be kept in the loop on certain things. Keep these people minimally involved since they could have the power to raise concerns or create roadblocks. Who controls the resources? These will be stakeholders on the client side as well as on your agency’s side, in case you need to request a scope or budget change or require more allocated resources from a certain discipline. Who has a financial stake/interest. Who has an emotional interest (don’t underestimate this; if this project was someone’s “baby,” keeping them happy and in the loop is critical). What are the top motivations for each stakeholder. Who are the biggest supporters. ​Who are the biggest non-supporters or naysayers. Once you’ve completed the exercises above, you should have enough information to begin analyzing your key stakeholders, and where they should fall in your map or matrix. Vivian Kloosterman is Managing Director at VK Consulting Environmental Engineers Ltd. in New Zealand, and the founder of the online business school Continuing Professional Development, which offers several courses on stakeholder management and analysis. Now you can begin to capture each stakeholder’s relative importance and needs visually. Start by adding the names of your stakeholders into the matrix, wherever you think they fit best. The client-side person we mention above, for instance, who is prominent in the department and whose opinion carries a lot of weight, might fall into the “Informed of Everything” quadrant, because not to do so would pose risk of disruption by that person - even though he is not technically part of the project team. As you fill out the matrix, you can use different colors to write the names. If you know one member of the client project team does not have total buy-in on a component of the project, perhaps you can mark her name in red, in addition to placing her name where she needs to go. By color-coding stakeholder names, everyone on the agency side of the project understands that communications with her may need to include more explanation, or occur more frequently. If you handle her and her communications correctly, you may find she becomes a big supporter and you can turn her name green. When you use the opinions and influence of your most powerful stakeholders to help shape the project, you and the project will be better equipped for success. Best of all, you won’t waste precious time and resources overly communicating to those who simply don’t require it. In addition, your key stakeholders with the most weight and influence can help you gain resources, prioritize competing demands for resources or timelines, and clear potential roadblocks. Therefore, these higher priority stakeholders are important to identify and manage well. The stakeholder analysis and matrix that you’ve begun to create can help you and your whole team see who needs to be managed in what way for the project to have the best outcomes. “Be sure you are aware of all your stakeholders’ influence, as well as how it changes during the course of a project,” Kloosterman says. Whatever you map at the beginning of the project captures that snapshot, but make sure your stakeholder matrix is an organic document. “Be aware of ongoing change, and allow for it by changing communication and engagement levels,” she says. The grid could include rounds of copy and design review as well as daily, weekly, or monthly updates on progress, budget, and next tasks on the horizon. You can share with your clients by saving the grid to a shared drive, and use an automated tool to email the right people updates at the right frequency. You might do a weekly high-level report for the clients via a personal email from the project manager. Your internal stakeholders will want to see a burn report - hours forecasted vs. hours spent, and likely to be spent in the near future. Some stakeholders (like the executive leads) may need a more formal type of communication, but less frequently. Perhaps those stakeholders would prefer a monthly PowerPoint presentation that reports on the status, the features and updates that have published, the input and feedback that’s been received to date, and so on. Software solutions can help you analyze all your project stakeholders, and then map them according to their interest, impact, influence, and importance. Some programs can help you strategize and create stakeholder communications plans to keep all the right people apprised of the information they most need to have, when they need to have it. Smartsheet is a powerful collaboration and communication tool for project managers. The familiar spreadsheet layout makes it easy to organize tasks and assign roles so you can see at a glance who is responsible for which tasks. Once you create your Stakeholder Map, you can create a stakeholder contact list in Smartsheet. Use Smartsheet’s mobile app to get in touch with a vendor or team member in the field. Share the list with all project stakeholders and send requests to keep everyone updated. Store additional details, such as contracts and email correspondence, by attaching items directly to the rows in your sheet. In addition to centralizing stakeholder contact information, project managers will appreciate the real-time updates and the ability to alert the team about new changes using email alerts. It can also be used as a central repository for documents, project assets, and comments that everyone on the team can access from any location where they have an Internet connection. Increase transparency with stakeholders by sharing your templates, and easily switch between Grid, Gantt, Calendar, and Card Views to visualize your project timeline. For people and teams that want to work more visually, and for situations where a highly-visual view is most appropriate, Card View provides a powerful new way to visualize, share, and act on work in motion. See how easy it is to use Smartsheet to organize all your project management needs. Sign up for a free 30-day trial.